Creatine (Cr) is a compound made naturally in the body. It is manufactured in the liver, kidneys and pancreas and secreted into blood for transport to muscle (amongst other) tissues. Its chemical name is Methylguanido-Acetic Acid, formed from the amino acids Arginine, Methionine and Glycine (Collier, J. 2004). Creatine has a number of major functions as a sports supplement. Basically, it increases strength and power, especially ‘power endurance’ that is required for high intensity intermittent exercise; such as weight training and sprint-training. Results regarding the ergogenic effect of Creatine (Cr) on anaerobic performance in sedentary and active subjects are equivocal. As for the anabolic role of various Cr regimens, an increase in body mass (1.5 kg only, on average) is often reported (e.g. Greenhaff et al, 1995) while unobserved in many other studies (e.g. Juhn, 2003). Due to the small number of studies and the variety in methods used to monitor body composition, it is difficult to identify the components that are affected by these changes. In fact, some have observed significant gains in lean body mass in subjects ingesting Cr, while others have not. Body weight gain might be due to an increase in intracellular or total body water, but this hypothesis has been challenged (e.g. Saint-Pierre et al, 2002). 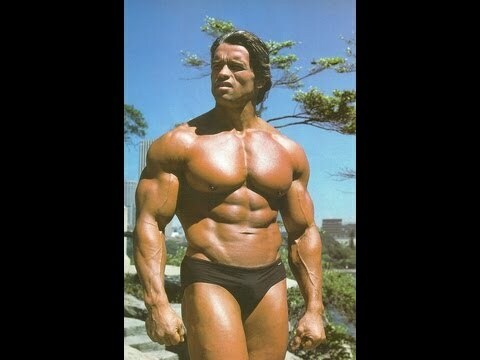 Arnie, somehow got this massive before creatine was available!? What is the research on Creatine? Of the approximately 300 studies that have evaluated the potential ergogenic value of Creatine supplementation, about 70% of these studies report statistically significant results while remaining studies generally report non-significant gains in performance (e.g. Balsom et al, 1993). No study reports a statistically significant ergolytic, negative effect. and work performed during repetitive sprint performance 5–15% (e.g. Greenhaff at al 1997). There are three main energy systems that the body calls upon to produce energy. The ‘best’ energy system for power and strength output is the “ATP-PC” system. Supplementing with creatine, provides more fuel for the ATP-PC system, allowing maximal power output, for longer. Short-term creatine supplementation (e.g. 20 g/day for 5–7 days) has typically been reported to increase total creatine content by 10–30% and phosphocreatine stores by 10–40%. It has been suggested that creatine supplementation produces an ergogenic effect by increasing the resting intramuscular stores of creatine phosphate. The increased dietary intake of Creatine would stimulate the formation and storage of “extra” phosphocreatine within the skeletal muscle and, in doing so, delay the gradual depletion of intramuscular phosphagen stores that is thought to occur during sustained high-intensity muscular activity (cf.www.gssiweb.com). Greenhaff et al (1994) proposed that after creatine supplementation, the rate of creatine phosphate resynthesis from mitochondrial ATP is increased due to creatine availability and an acceleration of the creatine kinase reaction. This increase in phosphocreatine resynthesis may explain why there is an increase in total work output observed after repeated bouts of exercise. Creatine is found in two forms in the body, two-thirds as creatine phosphate (PCr or phosphocreatine) (Maughan, 1995). The remaining one-third exists as free creatine (Maughan, 1995). Together, free creatine and PCr form the total creatine pool (Balsom, 1994). There is 3-4 times the amount of PCr in resting muscle compared to adenosine triphosphate (ATP) (Oopik, 1994;Tortora et al, 1993). The phosphagen energy system (also called alactic, ATP-PC system) provides the body with energy for short duration, high intensity exercise. Two compounds are predominant in this system – adenosine triphosphate (ATP) and phosphocreatine (PCr). The phophagen system is used during the initial few seconds of high intensity exercise. Diagram 1 represents somewhat of an oversimplification since, in reality, aerobic pathways are used even in very short duration, high intensity exercise (e.g., 10 seconds), but to a small degree. ATP is the energy currency for all cells in the body In resting muscle ATP has a concentration of approximately 24 mmol/kg, sprinting requires approximately 10-15 mm/kg/s of ATP hydrolysis (Maughan, 1995). ATP is required to break the cross bridge between myosin and actin when the myosin head is in its low energy state, after completing the power stroke which causes muscle contraction. Creatine kinase acts as the catalyst for this reaction which takes place in the muscle myofibrils (Bessman et al, 1981). This reaction allows higher workloads to be sustained for greater periods by providing the ATP necessary for muscle contraction (Bessman et al, 1981). While the buffering of ATP is the primary task of PCr, it also functions in other processes. One such process is the phosphocreatine shuttle which transfers energy from the mitochondria to the myofibrils as phosphate units (Meyer et al, 1984). This process acts during recovery from exercise. During this time ATP is regenerated in the mitochondria by oxidative phosphorylation. A high energy phosphate is removed from ATP and attached to free creatine for transport to the muscle myofibril (Meyer et al, 1984). PCr is the form of transport for the ATP-donated phosphate). Only 8% of the total creatine pool is able to function as part of the phosphocreatine shuttle (Oopik et al, 1995). A study conducted by Harris, Soderlund and Hultman (1992), examined creatine content in the quadriceps femoris muscle in 17 subjects after supplementation of 5g of creatine monohydrate 4-6 times a day for two days. The results showed a significant increase in the total creatine level in all subjects but the values were especially pronounced in those with the lowest muscle creatine store at the beginning of the study. This study also showed that the increase in total muscle creatine was even greater in exercised muscle than in non-exercised muscle and that there was no change in the level of ATP in the muscle samples. The increased creatine level in the exercised muscle was thought to be due to increased blood flow and better creatine delivery, perhaps through catalysed by increased levels of insulin and GLUT 4 activity (Harris et al, 1992). The theory is that by increasing the amount of creatine in the diet one can shift the equilibrium and cause an increase in phosphocreatine in muscle. An increase in the muscle creatine level will do little or nothing to affect the availability of energy to muscle, but by increasing creatine availability to creatine kinase it is thought that there will be an increased conversion to phosphocreatine. This increased conversion will thus allow for increased availability of high energy phosphate during periods of anaerobic exercise. It has also been suggested that by increasing the availability of creatine there is an increase in the resynthesis of phosphocreatine during exercise and recovery resulting in delayed muscle fatigue. Does Creatine Increase Muscle Strength? Greenhaff (1993) conducted a study, showing the influence of oral creatine supplementation on muscle torque, comparing a placebo group to subjects who had ingested creatine. The subjects did 5 sets of knee extensions, 30 repetitions each, and results were taken before and after ingestion of either placebo or creatine. The results showed no change in the placebo group but a statistically significant difference in muscle torque during the 2nd and 3rd sets in the creatine group and a nearly significant increase during bouts 4 and 5. The effect of creatine loading on the performance of sedentary and recreationally active individuals has been well documented, but research on well-trained individuals is still lacking. A double-blind study conducted by Rossouw et al (2000) examined the effect of creatine monohydrate loading (9g/day) on maximal intermittent isokinetic exercise and sport-specific strength in 13 well-trained power-lifters. There was also a significant (p = 0.010) increase in the dead lift lifting volume after six days of creatine supplementation. These results suggest that creatine is a beneficial ergogneic aid to highly trained power athletes. Both isolation and compound weight lifting movements appear to be improved with creatine supplementation. No. The influence of creatine ingestion on endurance exercise performance was also investigated by Balsom et al (1994) and showed that creatine supplementation does not enhance performance or increase peak oxygen uptake during prolonged continuous exercise. In fact, there was actually decreased performance shown by the creatine supplementation group in this study, thought to be due to weight gain. Can Creatine Help Sick People? Most sports nutritionist will say “No” – take 5g per day for 2 weeks for the same level of creatine stores in the muscles. However a meta-analysis carried out by Branch in 2003, showed a greater change in body composition, for those athletes who loaded with creatine. Does Creatine Help with Single Bouts of Exercise? Other issues still surrounding creatine supplementation, include the supplements effect on single exertions, such as a single 100m race; more specific research is warranted in this area. An improvement in 100 m sprint time is self-evident, but the value of improved intermittent 6 x 60m sprint times is not so obvious. Creatine supplementation may improve the quality of training, leading to greater gains in sprint performance. A ‘critical review’ conducted by Juhn & Tarnopolsky in 1999 concluded that; the data on a single sprint or first-bout sprint of any kind are inconsistent. The data regarding creatine’s ergogenic effects on mass-dependent activities, such as running and swimming, are not convincing, perhaps because of the side effect of weight gain from water retention. Studies on weight lifting suggest that creatine improves strength possibly by increasing myofibrillar protein synthesis however, more data is needed to prove this. Individual response to creatine supplementation can vary greatly. ATP is the molecule which when broken down releases energy for the muscle to contract. When used up, ATP needs to be replenished by re-acquiring phosphates. CP acts as a phosphate transporter. CP gives up its phosphate to ATP freeing creatine to form the bi-product creatinine for excretion. Numerous studies have demonstrated that the more creatine that is present in muscle cells, up to a maximum storage level, the more efficiently ATP can be replenished, and, hence more ATP is available for energy. The richest food source of creatine is meat and fish, but it has been found that muscles can store far more CP than is possible to obtain from food (Hultman, et al 1996). It has been demonstrated that creatine may also promote muscle growth by stimulating protein synthesis in two ways. Firstly, the increased work an athlete is able to do as a result of its energy replenishing actions. Secondly is that the more CP that is stored in muscle, the more water is drawn into muscle making it fuller and stronger. With more CP and water in muscle, the volume increases, and the muscle cell is ‘volumised’ or ‘super-hydrated’. A volumised muscle helps to trigger protein synthesis, minimise protein breakdown and increase glycogen synthesis (Haussinger 1996; 1996). If a muscle is then trained properly, this could lead to enhanced muscle growth. The muscle ‘pump’ experienced when using creatine is reported to be much more intense, and this is as a result of the cell volumising effect. Creatine may also act as a lactic acid buffer and improve exercise recovery time. Lactic acid is a bi-product from anaerobic (without oxygen) exercise, such as weight training. Lactic acid is responsible for the ‘burning’ sensation when the muscle becomes fatigued. Creatine may act as a buffer for this lactic acid, which helps to delay the onset of fatigue. It is via these physiological mechanisms that creatine enhances anaerobic performance, and has become the most popular ergogenic aid, ever marketed. High glyceamic index carbohydrates and alpha lipoic acid, are currently advocated as the best foods and supplements to accompany creatine ingestion. Study here on alpha lipoic acid, sucrose and creatine ingestion. Creapure creatine from somewhere like theproteinworks or bulkpowders. I’ve yet to find any research that supports the use of creatine ethly ester over creatine monohydrate.